First up, Estates at Grassfield Meadows. This is a cul-de-sac ‪‎new homes‬ community with one acre lots in Chesapeake, VA. Built by Oceanside Building, LLC, these homes have amazing features in a great location–walking distance from Grassfield High School! 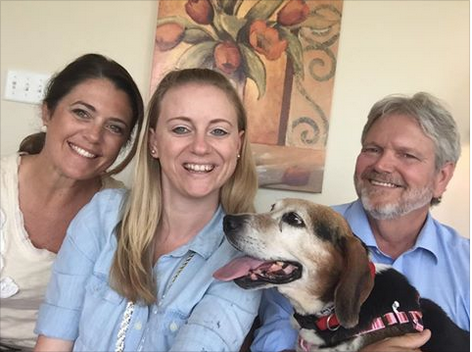 PLUS, our featured pup from this session, June Bug, found her fur-ever home! Learn more about Estates at Grassfield Meadows by checking our full blog feature here. The next featured community in my ‪#‎AskJenLive‬ “Summer Round Up” is Shadowlawn North. This ‪new homes‬ community is all about beach living and is built by Bishard Homes in Virginia Beach. This community has great design details, including beautiful shutters and carriage style garages. Our featured pup, Bey, from this session also found her fur-ever home! Learn more about Shadowlawn North by checking our full blog feature here. Up next is the ‪#‎newhomes‬ community of Summer Park. This highly sought-after area and community is truly a serene neighborhood, with tree-lined streets and stunning homes built by award-winning builders such as Stephen Alexander Homes & Neighborhoods, Christopher Kait Construction, LLC, Rob the Builder and DSF Development. Learn more about Summer Park by checking our full blog feature here. The next place I visited this Summer was the ‪new homes‬ community of Harbours at River Bluff built by Platinum Homes in Suffolk. This exclusive, deep-water access community has some incredible views and the homes are designed with entertaining in mind. Learn more about Harbours at River Bluff by checking our full blog feature here. My next ‪#‎AskJenLive‬ recap is from my North Suffolk tour of the following ‪‎new homes‬ communities: Bob White Landing by Napolitano Homes, Parkside at Bennett Creek by Christopher Kait Construction, LLC and Governor’s Pointe by HHHunt Homes. And we can’t forget my featured pup from this session, Quinn, who charmed her way into her fur-ever home! Learn more about our offerings in North Suffolk by checking our full blog feature here. The next featured community in my ‪#‎AskJenLive‬ “Summer Round Up” is Stockbridge at Tanglewood built by Hearndon Construction. This ‪#‎newhomes‬ community offers quality and value at an affordable price. Choose from numerous floor plans to fit the way you live and in the style you deserve. Our featured pup, Ray Ray, from this session also found his fur-ever home! Learn more by checking our full blog feature on Stockbridge at Tanglewood here. Next up ‬ is Bedford Place by ABT Custom Homes, LLC. This exclusive community will have 13 total homes that have a beautiful Craftsmen style at an affordable price, starting in the mid $200s. Our featured pup, Simon, from this session also found his fur-ever home! Learn more by checking our full blog feature on Bedford Place here. The final featured community for my “Summer Round Up” is last week’s ‪#‎AskJenLive‬ at Madison Landing built by Bishard Homes. You probably recall the super cute puppy, Spotswood who joined me! Madison Landing has 4 remaining homes under $200,000 and is centrally located in Virginia Beach. Learn more by checking our full blog on Madison Landing here. Thank you for tuning into #AskJenLive throughout the Summer! As always, feel free to reach out with any questions–I look forward to helping you find the home that’s right for you!